Hmm, I thought I was going to have some soup for lunch. I guess I forgot to heat it up. Oh wait, it’s still cooking? What is that smell? We had a microwave once that used a dial timer. It’d occasionally get stuck, and if you were delayed, you’d come back to find out your three-minute pizza pocket has become a fifteen-minute hunk of black stone. Milk explodes when you heat it too long. Once I opened the microwave, and the cup was quite close to the door and there was no milk in it, but there was white stuff splattered over the walls. 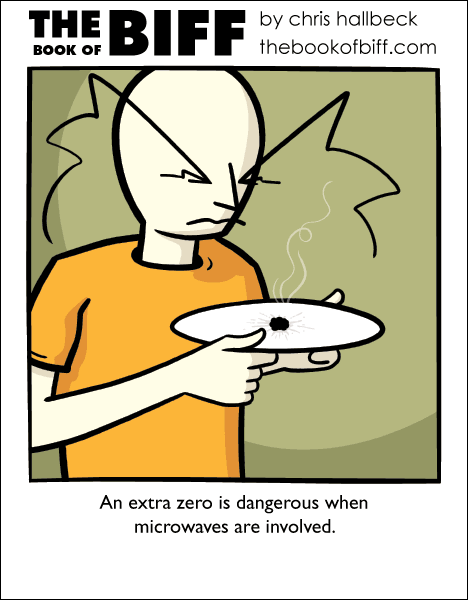 And why can you set a microwave for 99 minutes and 99 seconds? Anybody doing a slow cooked roast in these things? This reminds me of the first time I microwaved a bag of popcorn… There was a disgusting, black lump in the middle that looked like the thing on Biff’s plate there (but quite a bit bigger). We heat tortillas by wrapping them in a towel and and microwaving them for a few seconds. An extra zero led to the towel catching fire. Did everyone else know you’re not supposed to put the cup of noodles in the microwave? It says it right on the cup-DO NOT MICROWAVE. I’ve been eating these for years and never noticed. I swear they taste better than if you just pour in hot water, like it says to.